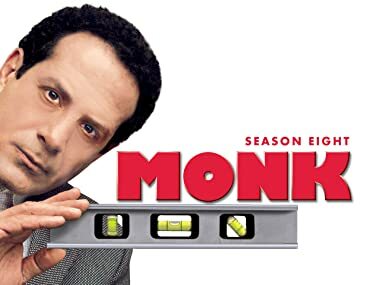 In its eighth and final season, MONK returns with Emmy, Golden Globe and SAG Award winner Tony Shalhoub as Adrian Monk, the obsessive-compulsive detective. When an attempt is made on the life of a former child star who recently published a tell-all biography, Monk is thrilled to act as her bodyguard -- until he learns exactly how different she is from her TV alter ego. Elizabeth Perkins and Rena Sofer guest star. While investigating the puzzling, high profile murder of a maid whose assailant apparently tried to treat her wounds, Monk finds himself increasingly drawn to another case involving a visiting African man investigating his beloved wife's hit-and-run death. Adewale Akinnuoye-Agbaje guest stars. Monk must uncover the link between a missing girl and a UFO sighting after Natalie's car breaks down in a small desert town. Daniel Stern guest stars. Monk assumes the identity of a dead hit man in an effort to foil an assassination plot. Reed Diamond, Kelly Carlson, Vincent Curatola, Tim Bagley and Eric Balfour guest star. Monk's phobias threaten to undermine a big murder case when an aggressive defense attorney targets the detective's unconventional methods in court. Jay Mohr guest stars. Natalie becomes convinced a critic (Guest Star Dylan Baker) who panned her daughter Julie's theatrical performance was responsible for a murder at the same time as the show. Voodoo appears to be the only explanation when unmarked dolls sent to San Francisco residents accurately predict a series of inexplicable deaths -- including, perhaps, Natalie's. Meat Loaf guest stars. When Monk's insurance company refuses to pay for more individual therapy sessions, Monk joins Dr. Bell's therapy group, where somebody appears to be murdering his fellow patients. Tim Bagley and Hector Elizondo guest star. Natalie tries to throw a surprise birthday party for Monk while he investigates the mysterious death of an office building's maintenance man. Virginia Madsen and John Carroll Lynch guest star. When Sharona returns to San Francisco to handle legal issues related to an uncle's death, Monk suspects foul play and finds himself torn between the differing styles of Sharona and Natalie. Bitty Schram guest stars. Monk reluctantly adopts a dog while looking into the suspicious disappearance of its owner. Wallace Langham guest stars. To woo the lone holdout on the reinstatement committee, Monk accompanies Lt. Disher on a scouting trip with the man's troublesome son -- where nature isn't the only thing the troop has to fear. In order to save the wedding of someone close to him, Monk must first find out who is trying to sabotage it and why. Monk finds his return to the police force to be more challenging than he expected when he becomes involved in the case of a serial killer. Monk is called to a crime at the location where he first heard the news of his wife's murder and begins the most important investigation of his life. Monk pursues the killer of his wife in the series finale.